Rescue and rehoming in Broxbourne and East Herts. Pink Kitty will be in the Hertford store on Saturday, 16th and Wednesday, 20th December. The team at Support Adoption For Pets and Pets at Home have invited Cats Whiskers Rescue to take part in their biggest fundraiser of the year, the Santa Paws Appeal. Please visit Pets at Home, Hertford, and donate any spare pennies and cat food to the Santa Paws Appeal. Cats Whiskers will receive 50% of all monies raised in the Hertford store. We will also receive exclusive access to the donation bins in the Hertford store during the campaign period to help the cats and kittens in our care. On Friday 1st December, we will be in the Drill Hall in Ware for the Dickensian Evening. Come and buy all you need for the holiday season, and perhaps see Pink Kitty twerking again! Today is National Black Cat Day. Why celebrate these cats in particular? 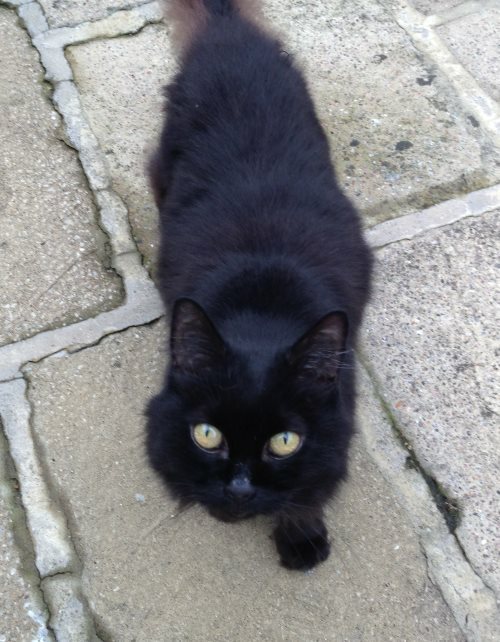 Sadly, many people still view black cats as unlucky or are associated with the occult. The increasing popularity of Hallowe’en with its black cat motifs only makes the situation worse. Black cats in rescue centres are often the last to be adopted, regardless of age and temperament. Instead, let us celebrate our mini panthers! Sleek or fluffy, our ebony companions deserve the same love and respect as their more colourful siblings. We currently have three black foster cats: Bonnie, Jack and Jill. If you would like to sponsor our special cats, please contact us. We will be visiting Asda in Ware on Saturday 25th November. 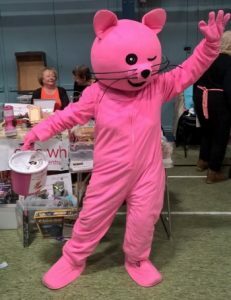 Come and meet our volunteers, find out about the work of Cats Whiskers Rescue, and say hello to our mascot Pink Kitty. The date of this event has been changed again from the 4th and the 18th November. Apologies for any confusion. We have been selected by Asda Ware as one of three local good causes for their green token collection in October, November and December. Please remember to pop your green token into our box when shopping at Asda in Ware. The charity that collects the most tokens will receive £500. Thank you to Asda for supporting our cause. Cats Whiskers (HMRC Charity Number: EW37308) rescues and rehomes cats in Broxbourne and East Herts.